Our Floor stencils are perfect for creating custom painted floors in any space! 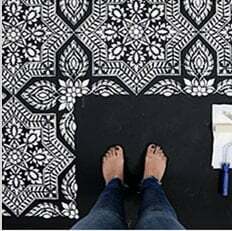 With our Tile stencils, you can create a tile floor look for the fraction of the price of the real cement tile. You can even stencil over your old dated tile instead of removing it! Just make sure to clean the floor thoroughly and then use an adhesive primer such as Stix, to ensure proper adhesion. Our Floor stencils can be used on cement floors, decks, patios, wood floors and even linoleum. Learn How to stencil floors and add some pattern and color to your floors with our reusable Floor stencils! For some stenciled floor ideas, please visit our Stencil Ideas gallery.